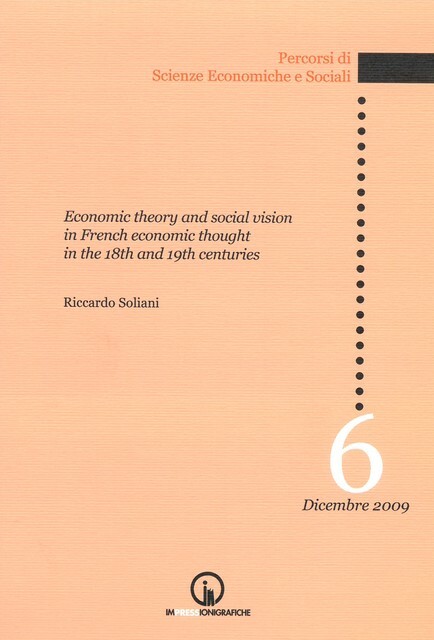 This book aims at tracing back the link between social vision and theoretical approach in three leading French economists, covering slightly more than one hundred years, since 1750 to 1850: Turgot, Say, Proudhon. In the first chapter I discuss the theories of value of Valeurs and Réflections and try to demonstrate that the differences between the two works of the maturity of Turgot can be led to their different purposes. The first paper on Say compares his theory of value and distribution with the issues proposed by Smith and Ricardo, giving evidence to its legacy from (and its contrast with) the Classical tradition. The second paper on Say focuses on his opinions on democracy and equality in relation with political economy and the market’s mechanism. After the controleur général Turgot and the liberal Say, the final stage of this reflection on the French economic thought is the utopian socialist Proudhon. The continous moving between economic analysis and vision of the evolution of man and society is the hallmark of all Authors examined here. The progress of humanity of Turgot, the méchanisme social of Say, the anarchic, utopian world of Proudhon are accompanied by actual theoretical advancement or, at least, audacious attempt in that direction.